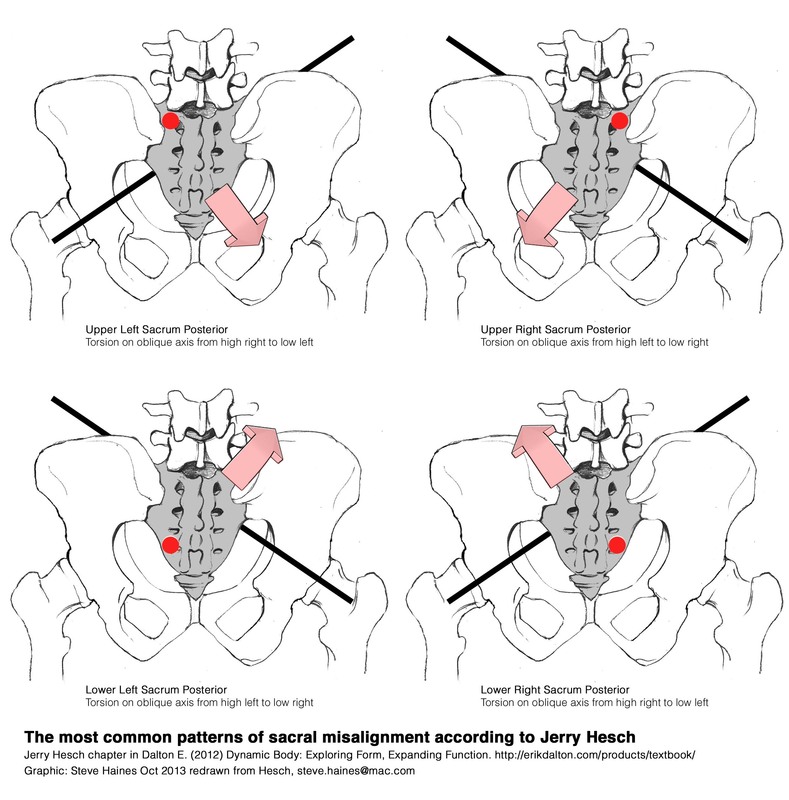 I recently came across Jerry Hesch writing on alignment and treatment of the sacrum. He makes a convincing case for the most common sacral misalignments being torsion on one of the two oblique axis as shown below. The graphic is mine (I found his images a bit hard to follow). The model is really simple, feel for the most posterior quadrant of the sacrum and you can work out how the sacrum is torsioned using the graphic below. Hesch says the most common pattern is posterior low left sacrum. From my experience of holding lots of sacrums over the last 13 years, I would agree sacrums are often torsioned along these oblique axis. It feels a really simple way to assess the sacrum and has helped me quickly clarify my experience during treatment this week. He includes more testing in his full assessment of the sacrum, including springing (‘springing with awareness’) the ‘four corners’ or quadrants of the sacrum in childs pose. The most posterior corner will also be the stiffest, with no anterior posterior recoil. His treatment is really simple as well, sustained anterior posterior pressure of upto 20lbs for 2 mins. The chapter is in a new book on soft tissue work by Eric Dalton. He has commissioned chapters from most of the leading fascia researchers and practitioners around right now. I have not heard of Hesch before, but he is in very good company in Eric Dalton’s book. Here is a video of him introducing his chapter. Excellent, thanks for the quick reply, good luck with spreading the model.